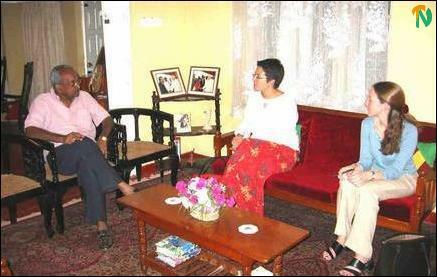 Deputy Secretary for Political Affairs at the British Embassy in Colombo, Ms.Margaret Tongue, and Official in-charge of SouthAsian affairs, Ms.Catherine Ceeve, met Batticaloa Parliamentarian Joseph Pararajasingham Thursday evening and had discussions on the current political situation in Colombo, sources said. Mr. Pararajasingham told the British officials the alliance between SLFP and the JVP will encounter difficuties in taking forward the peace process. "Since JVP has been vehemently opposing the peace process between the UNF and the LTTE, the new formation has created an environment not conducive to the progress of peace. If the new alliance triggers renewed war, the military response of the Liberation Tigers is likely to be swift and severe. I fear devastation for the country and its people in an unprecedented scale," the MP expressed his fears to the British diplomats. Responding to questions on Muslim-Tamil relationship in the east, the MP told the officials that both communities are amicably resolving trade and land disputes through peace committees comprising of respected citizens from both communities. Muslim farmers have restarted cultivating nearly 20,000 acres of land after the signing of the MoU, Mr.Pararajasingham told the British diplomats.